Comfort and sophistication blend seamlessly at Renaissance Baltimore Harborplace Hotel, an urban retreat in the heart of the famed Inner Harbor. 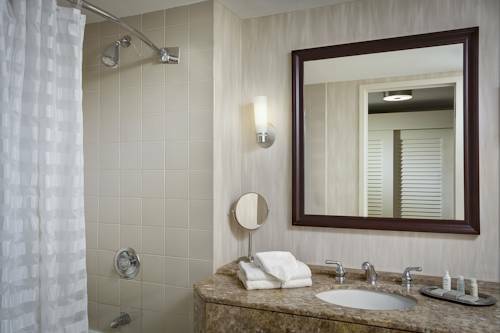 Whether you're visiting Charm City for work or play, you'll feel right at home in our contemporary, intuitively designed rooms and suites, which offer pillowtop bedding, marble bathrooms, ergonomic work areas and 24-hour room service. Many accommodations also boast Inner Harbor views. Additional hotel amenities include a modern fitness center and a heated indoor pool, as well as Watertable, our signature restaurant, which showcases seasonal American fare. Those hosting events in the area will appreciate our recently renovated venues, which range in size from small boardroom-style spaces to an impressive ballroom that can seat 2,000. If you're in the mood to explore, our Inner Harbor location places the best of the city at your doorstep - from the Baltimore Aquarium to Oriole Park at Camden Yards. Plan your adventure today at Renaissance Baltimore Harborplace Hotel. Watertable: With a scenic waterfront location and locally sourced American dining, Watertable is a wonderful destination for breakfast, lunch or dinner. Join us in the morning to fuel up for a busy day in Baltimore, or stop by the restaurant for an evening meal. Watertable Lounge: Cap off your afternoon in Baltimore's Inner harbor with a cocktail at Watertable Lounge, where you'll also find an extensive wine list and tasty light dining options. The Ground Floor Cafe & Bar: Order your favorite Starbucks coffee drink at The Ground Floor Cafe & Bar, which also offers freshly baked pastries and on-the-go meals. Free access in the caf enables you to stay connected during your time in the Inner Harbor. Fire Museum of Maryland, Inc.